Color Coded To Avoid Cross-Contaminating Buckets! 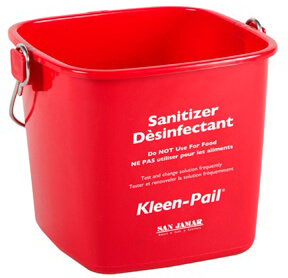 Keep your station clean and organized with the San Jamar Kleen-Pail! 6 quart capacity, made of durable impact-resistant plastic, with an easy-to-identify red color, this pail is ideal for cleaning and sanitizing. Go ahead, toss ?em- whether it be your aprons, gloves, or anything else you need sanitized with its sanitizing solution. It's unmistakable red color makes it easier to avoid hazardous mix-ups that could result in cross-contamination. Plus, it meets HACCP dedicated use guidelines so you can use it for cleansing and sanitizing purposes without worry. Ease of mind, ease of use, that's what San Jamar is all about!